The world’s largest arms fair will quietly set up shop in London, In September 2019. It will sell weapons and tools of torture to delegates from all over the world. As in 2017, Art the Arms Fair will make sure that it doesn’t go unnoticed. The award-winning group Art the Arms Fair are putting out a Call to Arts, asking for donations from artists who oppose the London Excel arms fair. 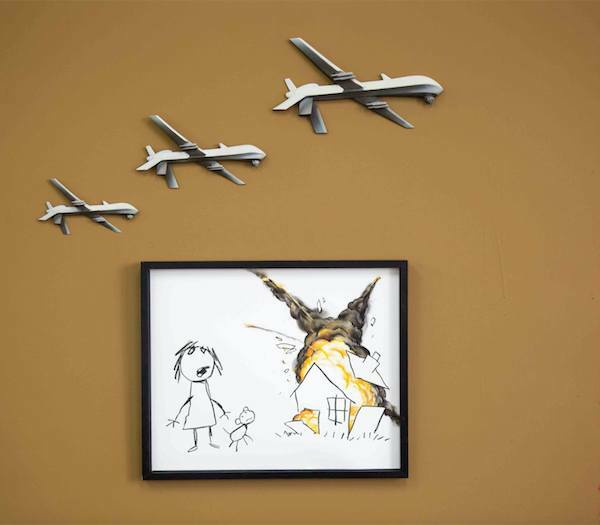 Banksy the notably subversive Street-Artist donated Civilian Drone Strike to the 2017 Art the Arms Fair exhibition. 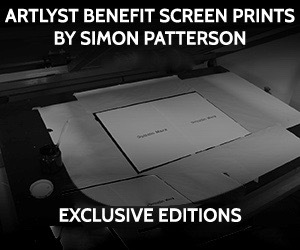 This piece went on to raise £205,000 for Campaign Against the Arms Trade and Reprieve. From 10 – 13 September, Art the Arms Fair will return with three exhibitions at Maverick Projects in Peckham, coinciding with the Excel Arms Fair. These exhibitions are at the heart of a push to highlight the complicity of the British government in global killing made possible through the arms trade. Human rights abusing countries are openly courted during the fortnight of the Excel arms fair. Around $100 billion worth of arms are sold every year, with buyers spread across the world. The works of art on display at the Art the Arms Fair exhibitions will seek to highlight the consequences of this trade. 1 May 2019 marks the Call to Arts deadline. Artworks can be submitted Here.